The idea for Dog TV — a streaming channel for dogs to watch while their owners are out at work or school during the day — came from an unexpected place: a cat. Ron Levi, a radio and TV host in Israel, hated how sad his cat Charlie looked when Ron left the house to go to work every morning. Levi started wondering what would happen if pets had something to keep them entertained while their owners were away, and soon it came to him — an animal-friendly TV station that owners could leave on all day long. After a few years of research on the subject of pets and separation anxiety, plus some test runs on dogs in cramped New York and L.A. apartments, Dog TV became a reality. 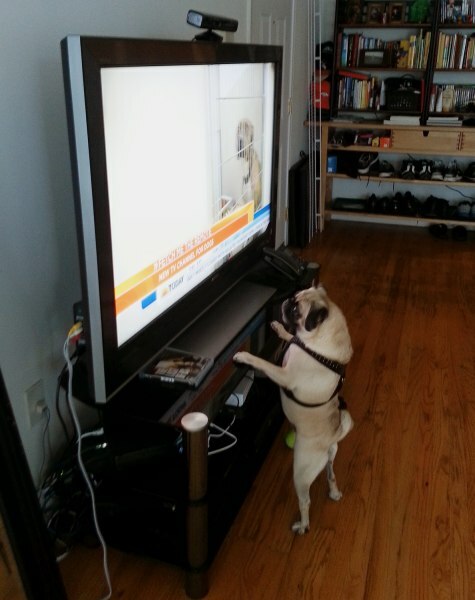 TODAY producer Feliciano Garcia’s dog Raisin was a big fan of this morning’s ‘Dog TV’ segment. Levi admits that the research was the easy part — convincing the dogs’ human owners to try out the channel was more difficult. People worried that their pooches would get overly excited and knock over the TV, or that they’d turn into doggie couch potatoes. Levi partnered with Tufts University in Boston to install cameras in homes where dogs were left alone for eight hours a day watching Dog TV, and there hasn’t been a single TV-related fatality yet.